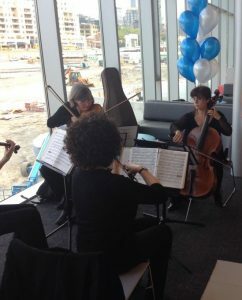 Concordo’s musicians have been serving southern Ontario event-goers with their music for decades. 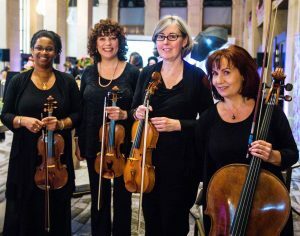 Their string quartet and trio perform or weddings, receptions and other special events in all sorts of locations from the most elegant venues to casual backyard celebrations. Besides weddings and receptions, members of Concordo have performed for a wide range of functions including the Toronto Film Festival, the Gemini Awards reception, mayoral levies, a political fundraiser and even a construction site complete with hard-hats. Concordo has a varied selection of music that is guaranteed to suit all tastes. “The Concordo Quartet participated in our Weddingbells High Tea event for our clients who are advertisers in the bridal market. Concordo was punctual, professional and they played beautifully and flawlessly. And, their selection of pieces was absolutely perfect and appropriate for the event. Numerous colleagues and clients mentioned to me that they enjoyed the music and were very impressed. The gorgeous melodies enveloped the hall in warmth without overpowering, and was the cherry on top in creating the perfect bridal event experience. I would highly recommend the Concordo Quartet.